Posted in: Art, Music, Photography. Tagged: 1928, American, Nelson-Atkins Museum of Art, Oil on canvas, Pavonia-Jersey City, Pretty Woman, Reginald Marsh, Roy Orbison. 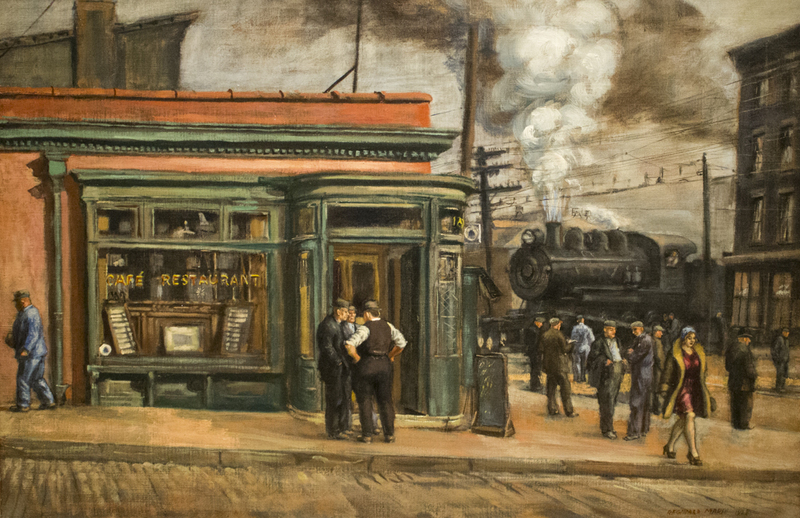 'Reginald Marsh's Pavonia-Jersey City shows casual activity in an industrial district in New Jersey. An attractive woman strides along the sidewalk of Pavonia Avenue and catches the attention of two men. Her allure is suggested by not only their gawking, but also the locomotive's whistling smokestack. Her rich red dress and position at the corner of the composition, where the entire weight of its design accumulates, ensure that she is the painting's primary focus. Well, this deserves a special mention as its painted around my neighborhood. Thanks so much for sharing Maverick. Lol.. I’ll gladly take that as a compliment. This is a fun painting. I like the style; realistic but not photorealistic, a bit cartoonish but no too much. You know, what really draws my attention is the menacing steam cloud from the train – it looks so impressive and forceful! I love it.